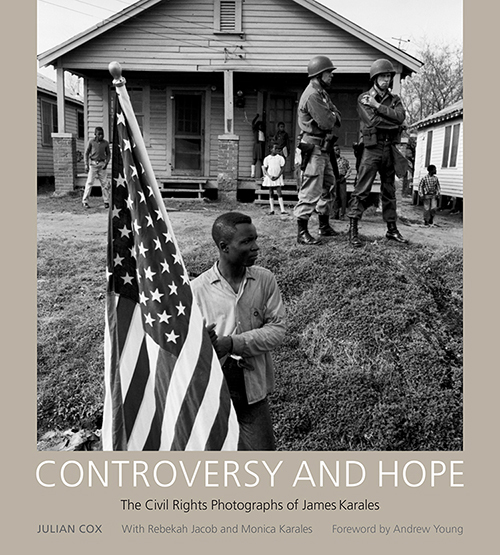 In honor of Dr. Martin Luther King, Jr., this week we’re highlighting a recent addition to our collection: Controversy and Hope: The Civil Rights Photographs of James Karales. Karales was born in 1930 in Canton, Ohio. He attended Ohio University, switching his major from engineering to photography after seeing the work of his photographer roommate. After graduation, Karales moved to New York and eventually became a staff photographer for Look magazine in 1960. This job not only allowed him to travel the world, but also gave him the opportunity to document the civil rights movement over the course of several years. During this time he developed a professional relationship with Dr. Martin Luther King, Jr., and became one of only a few photographers who were granted access to King’s home. The photographs in Controversy and Hope include a range of assignments between 1960 and 1965, culminating the historic Selma to Montgomery March for Voting Rights. Karales documented not only the major events of the civil rights movement, but also the preparations leading up to them, including quiet moments with the King family at home. Many of the book’s photographs are previously unpublished, providing a rare and unique view of events that changed the nation.